Toyota has once again set a benchmark with the Innova Crysta. Now it is upto the competition to catch up. It has once again started to sell in large number despite the hike in price. That shows the level of confidence that people have in the Toyota Innova brand. We review the Toyota Innova Crysta in detail and tell you whether it is worth buying. Read on further. When seated in the Innova Crysta, one appreciates the fresh design of the dashboard. Toyota has given it a radical silver lined curve that outlines the dash accentuating its flowing design. This coupled with the dual coloured seats, chunky steering and soft touch door pads lend a plush feel to the cabin. However, we did notice inconsistency in the plastic grains on sections of the dashboard. On the other hand, you get plenty of storage space on the centre console, door pads, two slimmer-than-usual gloveboxes and two cup holders that can be drawn out from the dash. Visibility all around from the driver’s seat is as good as the earlier car, except for the third row quarter glass section whose window line is now slanting upwards. This slightly hampers the view while backing up. All the buttons and controls to the car’s functions, especially those on the touch screen, are raked and easy to access. However, the air-con controls and the chrome transistor-like buttons below the screen felt inferior. These are raked even more and a sunny day can make it difficult to read the air-con display. Steering mounted controls are large and have bigger fonts to aid visibility. The twin-pod instrument cluster looks contemporary, especially with the sporty bright blue rings on the dials along with the multi-function display in between. USB and aux-in operations are within reach from the middle row as they are smartly placed between the front seats with a provision to store your phone upright. Slide on to the front seats and you will understand that they are better contoured and offer an extra hint of back support than the outgoing car. Buyers will love the liveliness of the cabin, especially in the front and the second row which now houses adjustable ambient lighting. There’s more shoulder room in the second row and the seats are a huge improvement. They are much more supportive and larger than earlier. Second row legroom can be extended by using the lever on top of the front passenger seat. This brings us to the last row of seats and though they feel like a compromise for adults, ferrying people in them can be accomplished in acceptable comfort. Toyota has placed the middle occupant’s headrest in the boot, just in case it’s needed. With all three rows up, boot space is as good as the earlier Innova. It goes without saying that folding the middle and last row seats will help gain access to much more luggage space. 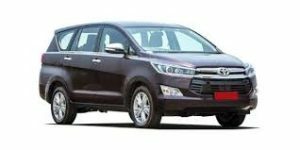 Toyota was quick to add that the new Innova Crysta will get three airbags, including a driver side knee airbag, ABS and brake assist as standard. The top of the line ZX will get seven airbags, stability control and hill-start assist to name a few. Also on offer is an integrated touch screen infotainment system with navigation, bluetooth, USB and aux-in. There’s a multi information display, Eco and Power modes, power mirrors that retract electrically, two-zone automatic climate control with rear on digital display and adjustable ambient roof lighting. Add to this seat back folding tables for the second row, powered front seats, and the capacity to hold up to 20 one-litre bottles. In the 2.4-litre manual, 100 km/hr in top gear results in 2200 RPM on the tachometer while the ton comes up in third gear. The new Innova does feel more relaxed while cruising unlike the old model where you would miss a sixth gear. Both the engines redline at 4500 RPM and the big improvement in the Innova is the refinement, there are very little vibrations inside the cabin. However, push the motor hard and the engine makes quite the sound, still better than the old Innova but could have been better. Fuel efficiency isn’t great with ARAI claimed mileage being 15.10 km/l for the 2.4-litre model while the 2.8-litre automatic manages 14.29 km/l, a mild hybrid system would have done the trick. The increase in weight by a considerable 200 kgs is reason to blame for the average fuel economy.